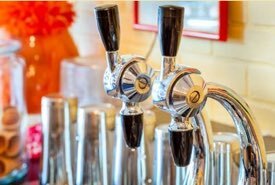 It's easy to set up your own home soda fountain in a corner of your family room. When the time arrives to serve your homemade sodas and soft drink beverages to friends, make it a special occasion by serving from a white marble counter top complemented by vintage soda fountain memorabilia to recreate a nostalgic look and atmosphere. All that's needed is some retro furniture and a few vintage accessories to simulate the appearance of the old fashioned soda fountain. The accessories are easy to acquire and you'll find them surprisingly affordable at the great source I've discovered. 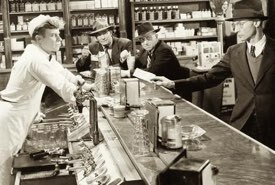 Before creating our own home soda fountain, lets consider what the old fashioned soda parlors actually looked like so we can simulate their appearance and heighten the nostalgia. 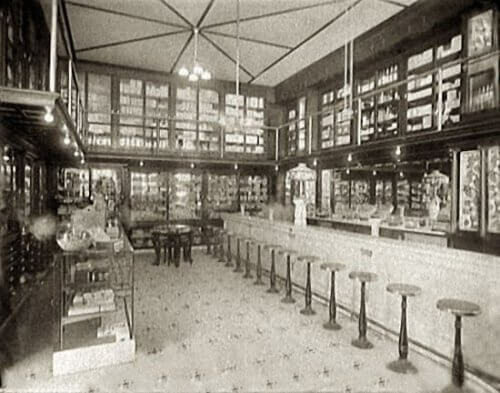 The above photo shows an old fashioned pharmacy soda fountain. Notice the ornate Tiffany-style lighting fixture centered on the marble countertop and although it's hard to see, stained glass decorates the sides of the mirror-backed rear cabinet at the far right of the photo. 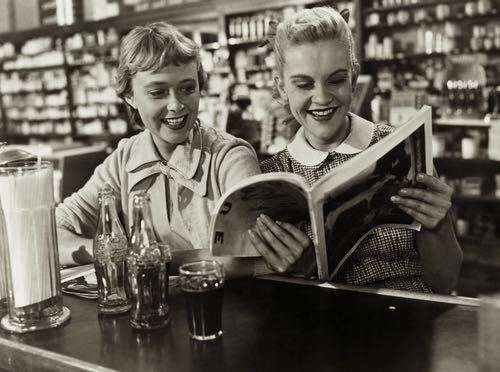 The customers enjoyed sipping their fizzy sodas while seated on the round wooden stools. 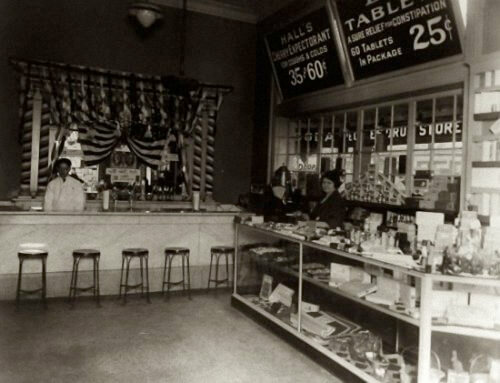 The small "front service" marble soda fountain pictured above features a gleaming white marble counter, wooden soda fountain stools, mirror-backed shelving, and an ornate wooden wall unit with glass doors to contain the syrup bottles, glassware, and other supplies needed. Note the hanging decoration over the counter to attract customers' attention, and the glass covered stand for displaying fancy cakes, pastries, and candies. 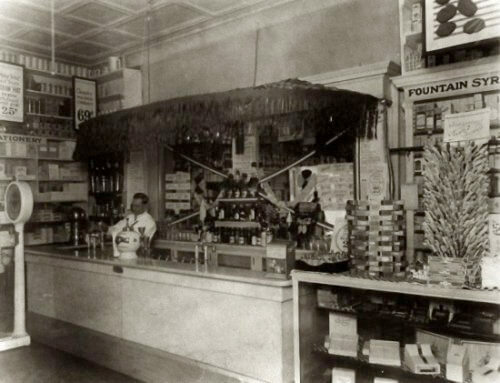 The above photo shows a fine example of an old time soda fountain tucked into the corner of a neighborhood drug store (1909-1932). Notice the glass-door cabinet for displaying fountain syrups at the far right. Also, note the typical marble counter featuring shiny syrup taps and an elegant ceramic dispenser nearby the soda jerk. Customers stood at this counter because of the limited floor space. Also note the coin operated weighing machine located near the counter that provided added revenue. 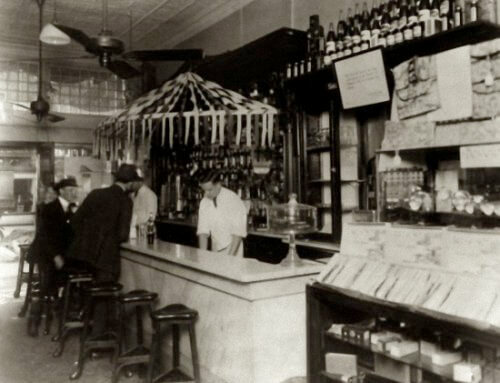 The above photo shows a typical 1920s soda fountain that would be ideal to recreate. 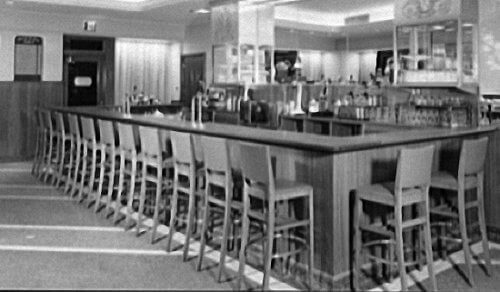 Notice the white marble counter with its classic metal stools in front. Also notice the striped bunting decorating the rear mirror flanked by its marble frame with striped pillars adding a festive appearance. Syrup bottles are kept handy on the rear wall shelf while what appears to be straw dispensers sit on the front service counter. An ornate glass light adorns the ceiling. Maybe you would prefer a more recent setup like the one featured in the 1946 photo of Schrafft's New York City soda fountain. The high wooden chairs and paneled wooden counter might be the vintage effect to aim for. Notice the large mirror to give the illusion of space, and the rear shelf unit to display the syrup bottles. The glassware is displayed in lighted glass cabinets above the bottles. Use the above photos for ideas that could you could incorporate into your home soda fountain. There's no need to go overboard, just create the general setting. 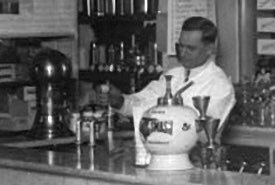 The serious home soda fountain enthusiasts install an actual CO2 powered commercial soda fountain such as those used in restaurants. It consists of a carbonator unit that combines CO2 gas with ordinary water to produce soda water, CO2 powered syrup pumps, and a dispensing unit with an ice container. But, you would need to find a secondhand unit for sale, as new units can cost several thousand dollars. Commercial soda fountains also require some technical know-how and frequent maintenance, and you'll need to source out a commercial supplier of flavored beverage syrups. You'll also be working with canisters of CO2 gas under pressure. Naturally, this route is best reserved for the serious hobbyist. Information is available online for those who are adventurous and interested, but you would need to drink many sodas to recoup the equipment and installation costs. Here are a couple of info sources that will get you started: Carbonating at Home and How to Install a Soda Fountain. If you prefer a much less complicated, much less expensive method of forced carbonation, a common CO2 soda siphon or seltzer bottle offers the perfect alternative. Soda siphons are affordable, easy to use, and completely portable. Replacement CO2 cartridges are commonly available and reasonable in cost. You can use soda siphons to force carbonate any beverage, including homemade fountain syrups, fruit juices, and ordinary plain drinking water. You'll be able to enjoy carbonated beverages any time. Let's consider the simplest, most affordable setup. A small home bar unit can be adapted for the front counter, and a Colonial-style hutch unit could be pressed into service as a rear cabinet by adding glass mirrors behind the shelving. The front counter surface could be covered with white marble flooring tiles at a reasonable cost to mimic the old time counters. Seating can be provided by common bar stools. Second hand furniture stores sometimes have stools for sale that feature a retro look. Antique soda pop bottles, vintage brand-name beverage trays, and footed soda glasses can sometimes be found at lawn sales and flea markets at reasonable prices. These items are perfect for decoration and even serving, providing the glassware isn't chipped. You can also buy home soda fountain supplies online, including affordable reproductions of vintage soda parlor items and the necessary glassware. You can obtain traditional fountain-style glassware online, including the retro paneled Root Beer mugs, paneled and fluted tumblers, and the traditional paneled and fluted soda fountain glasses. And when purchasing your supplies, don't forget to get some long-handled soda spoons, a traditional glass soda straw dispenser, and a set of nostalgic beverage coasters to set under the drink glasses. It's the little details that help to create the ambiance. To serve homemade ice cream treats with your sodas, you can purchase fluted and paneled sundae dishes, and retro looking banana split boats. Beverage blenders, cream whippers, quality soda siphons (seltzer bottles), and other home soda fountain supplies are also available at very affordable prices and help to give your home setup a professional look. And don't forget to decorate your walls with colorful reproductions of the vintage tin signs once prominently displayed in soda shops and old time lunch counters. Retro signs will help to give your room that authentic soda parlor atmosphere. As a no-cost alternative, search for illustrations of old fashioned beverage company signs on the Internet, download them, print them out in color on your printer, and framed them in traditional wooden frames. For fun, why not dress like a 1950s soda jerk with an authentic soda jerk cap, bow tie, and apron? These hard-to-find clothing items are available in various styles and colors, and when worn with a white shirt and black pants, they help to further the illusion. Kids will love to dress the part and serve your guests, especially if they receive a customary tip. If you handle and serve your homemade sodas with the same care, flourish, and pride as you would a vintage wine, your friends will eagerly await a taste treat. There's nothing like serving homemade soda pop in your own soda parlor to bring back memories and create fond new ones.